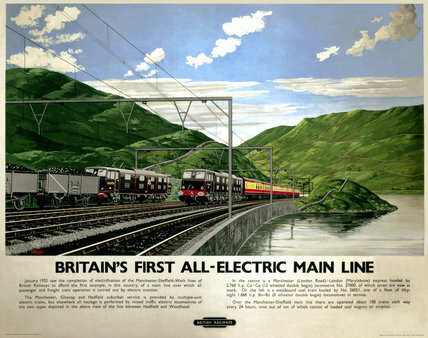 'Britain's First All-Electric Main Line', BR poster, 1955. Poster produced for British Railways (BR) London Midland Region (LMR), promoting the first main line service in Britain to operate all freight and passenger services by electric traction. 1955 saw the completion of electrification of the Manchester-Sheffield-Wath lines, creating the country's first all-electric main line. Artwork by V Welch. 'Trains of our Times', BR poster, 1948-1965.